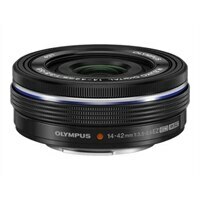 M.ZUIKO DIGITAL ED 14-42 mm F3.5-5.6 EZ is the compact standard 3x zoom lens. Achieving ZUIKO quality is paramount while designing for a compact form. The qualities of the electronic zoom were utilized for the outstanding usability on a standard zoom lens.